# Put the butter in a width pot and melt over low heat. # Add starch little by little by stirring. # Roast the starch over low heat by the help of a beater. # Roast it by stirring constantly for the first 10 minutes. 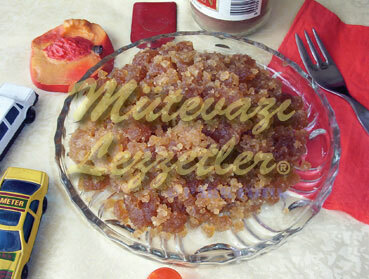 # When the starch reaches the right colour, pour the cold mixture of sugar and water on the hot halva carefully. # Cook over low heat for 5 minutes more by stirring. Remove the pot from the stove. # Put some paper towel between pot and its lid while covering. Let it stand for steeping at least half an hour. # Serve warm or cold. Note: the ingredient of the halva is starch. Because of that halva has an elastic and pre-colourless shape. So there is no need to shape it by a spoon.